There’s nothing new about a multidisciplinary approach to ballet – think of the towering cubist costumes Picasso built for Sergei Diaghilev’s Ballet Russes or the opulent sets that wowed audiences at the 1890 premiere of The Sleeping Beauty. There’s also nothing new about ballet melding with technology; British choreographer Wayne McGregor recently created a computer algorithm to structure his ballet Autobiography (2017), while the Martha Graham Dance Company just wrapped up a research residency at Google. 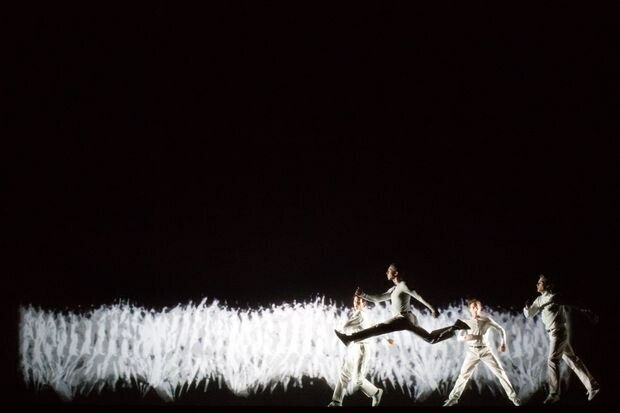 What’s more unusual about Frame by Frame, the National Ballet’s much-anticipated full-length work on Canadian animator and filmmaker Norman McLaren, is that it’s a collaboration between a choreographer and a director – in this case, the National’s Guillaume Côté and the legendary Québécois theatre-maker Robert Lepage. While choreographers often collaborate with composers, artists, fashion designers and even playwrights, it’s rare to see a ballet company commission a director, because it changes the law of the land. Normally, a new creation falls under the choreographer’s purview from start to finish – the idea of “direction” has no place beyond what the choreographer envisions and tells the dancers to do. Of course, Lepage is no ordinary director; he’s a theatrical sorcerer known for his radically inventive stagecraft. Creating an homage to McLaren was his idea; McLaren’s films were a big part of Lepage’s childhood (if you’re under the age of 50, you might not have heard of the National Film Board director at all). And ballet is no randomly assigned form; the Scottish-born filmmaker had a life-long love of movement and his most famous shorts are, in fact, dance films. Scottish-born filmmaker Norman McLaren had a life-long love of movement and his most famous shorts are, in fact, dance films. The results of this 130-minute collaboration are mixed. There are moments of striking beauty, in which the ephemerality of dance and the permanence of film seem to offer a poetic commentary on our changing world. The opening is breathtaking: several screens display images of men running in slow motion. Through the use of repeat printing, the men become a blur of movement until we realize that live dancers run among the images. The difference between what is real and represented is cleverly elided, making past and present momentarily the same. The ballet is structured in biographical segments that introduce us to key figures in McLaren’s life (the lead role is danced by second soloist Jack Bertinshaw). These are interspersed with theatrical interpretations of his films. The segments work best when it feels as though there’s a symbiotic relationship between the choreography and the stagecraft, to the extent that neither could exist on its own. A gorgeous (and successful) sequence has six ballerinas in silver unitards form a line of increasingly deep arabesques against a giant roll of Kodak film. To the sound of a clicking reel, they move downstage in tight, neoclassical turns – the movie comes to vibrant life. Another arresting scene takes place in Ludmilla Chiriaeff’s (Alexandra MacDonald) dance studio – Chiriaeff was the founder of Les Grands Ballets Canadiens and the choreographer of McLaren’s dance film, Pas de Deux. Bertinshaw stands in front of two mirrors that intersect in such a way as to reflect his image three times. The mirrors roll offstage and his reflections are replaced by cast members. As an old recording of Bach plays on the sound system, four McLarens dance with four Chiriaeffs. What I found so special about this sequence is that it creates a distinctly theatrical special effect in a show full of cinematic wizardry, thus contrasting the potential of both forms. One of McLaren’s most famous short films was his 1952 Oscar-winning ‘Neighbours,’ about two men who fight over their property line. But as a cohesive biography, or portrait of an artist, the ballet doesn’t quite come together. We never get close enough to McLaren’s emotional life to understand him or feel drawn into the orbit of his genius. And unlike a bio-ballet, such as John Neumeier’s Nijinsky, the piece doesn’t attempt to externalize McLaren’s inner world. Côté’s choreography is most effective when it’s tied closely to a specific visual effect. For example, he establishes McLaren’s relationship with NFB producer Guy Glover (Félix Paquet) by having the men fall in love at a production of Swan Lake. Their goofy pas de deux is positioned as a foil to the classical one between the Swan Queen and her prince. But when Côté picks up on the relationship in a later segment, titled Time, the choreography has a busyness that feels perfunctory. It reveals little about what the love between these men was like. One of McLaren’s most famous short films was his 1952 Oscar-winning Neighbours, about two men who fight over their property line. The film is bizarre and stylized and makes you wonder – in a good way – what sort of prelegal substances McLaren was smoking between takes. The stage adaptation we get is quite literal, but instead of the neosurrealist effect of two men behaving like puppets, Côté tacks on ballet steps that dampen the aesthetic. The scene devolves into fight choreography that just looks messy. There are similar problems with the adaptation of A Chairy Tale (1957), which goes on too long and whose humour feels dated. But then, near the ending, we are treated to a masterful rendition of the 1968 film Pas de deux, performed by Heather Ogden and Harrison James, whose images are captured on the screen behind them as they dance and layered to look stroboscopic. Côté doesn’t stray too far from Chiriaeff’s powerful and understated choreography so that, against the sound of haunting Romanian panpipes, the sequence has an almost mythical effect. Ogden’s restraint is exquisite here, as though she herself is a ghost from the past. It makes for a moving penultimate scene, in which our nostalgia for celluloid, film projectors and elemental choreography is processed through new technology to remarkable effect. Frame by Frame continues at The Four Seasons Centre until June 10.